If you log on to the Colt Recall Page you can obtain a FREE FedEx shipping label to return your O1911, O1918, New Agent or Combat Elite, or to receive a replacement part for the Defender Models. 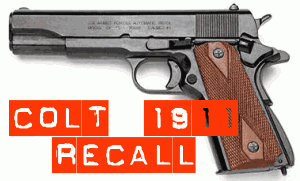 Share the post "Colt Recalls 1911-type Pistols"
I just got my New Agent back from Colt. The turnaround time was short but the quality of the repair is EXTREMELY POOR. The new safety lever has machine marks on it, a gouge at the top, bluing that doesn’t match, scratches visible under the safety lever, and a “bubble” in the finish applied over a “flake” in the obviously unpolished part. I can honestly say I have seen better quality on guns costing one quarter of this gun. This gun obviously has been diminished in value. I would NEVER have bought this gun looking like this and I will NEVER buy a Colt again, after this fiasco. I bought my O1918 already knowing about the recall and submitted my online request for a free shipping tag the day I took possesion. The tag came through regular mail in a couple of days. I tore up and old T-Shirt, wrapped my pistol in it, and stuck it in a 9″ x 12″ Evidence Clasp Envelope. I took that to my local FedEx drop of location, had it wrapped in some bubble wrap, and it fit snug into one of the free FedEx boxes. It was picked up around noon Monday, 21 September. It was dropped off here around noon today, 24 September. It was packed securely in a similar envelope with built in bubble wrap that was packed inside a sturdy cardbord box within the FedEx box. It was wrapped in the same piece of T-Shirt. Not a scratch on it and the new saftey looks great.